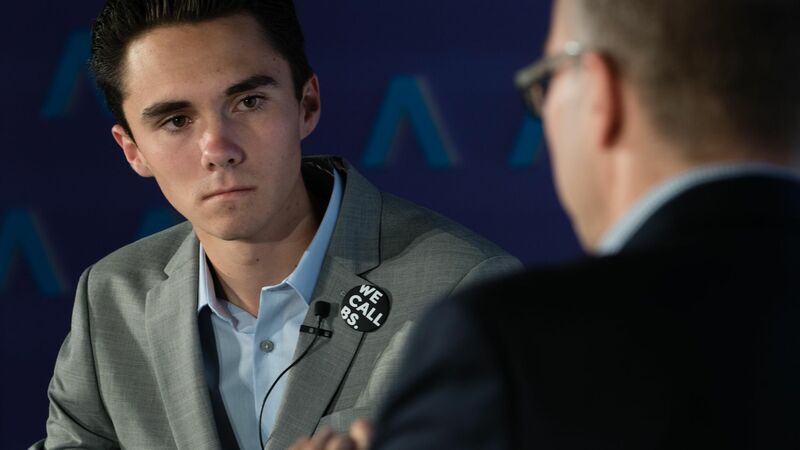 Hogg: Stoneman Douglas "is a prison now"
Marjory Stoneman Douglas student and #NeverAgain activist David Hogg told Axios' Mike Allen on Friday that his high school is "like a prison" since the shooting last month, with increased security and safety measures. Why it matters: What many Republicans have been advocating for is increased security in schools, including arming teachers. Hogg said that his concern with having more resource officers in the school is "racial disparity between the black and white students," and that the solution should instead be common-sense gun laws. Hogg advocated for better mental health care in the U.S., urging for "a lot more mental health solutions, and taking down the stigma." On his scuffle with InfoWars, Hogg said: "Power lies with advertisers to stop funding these hate-mongering people." On law enforcement: "I know law enforcement are some of the hardest working individuals in this country...We need to realize that there are serious issues not only at the FBI and Broward County Sheriff, but with politicians too who are responsible for government agencies." The biggest mistake the media made when covering the Parkland shooting, per Hogg, was: "Not giving black students a voice. My school is about 25% black, but the way we're covered doesn't reflect that." One more thing: Larry Keane, Senior Vice President of the National Shooting Sports Foundation told Mike Allen that he agrees "with the students and the rest of America, we think there needs to be change."